1. If in the string @ is present, apply Email validation else apply Username format validation. 2. 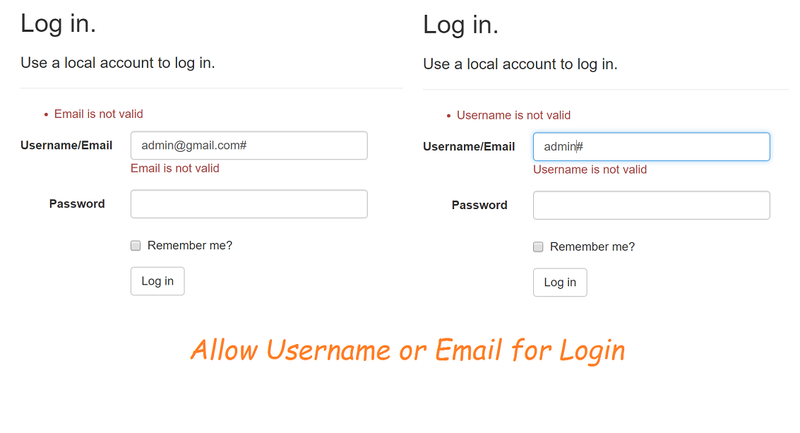 In case of valid Email, first we need to get Username. As it is considered that Username is unique so we can get it with userManager.FindByEmailAsync method. 3. Use Username for SignIn verification. No special need to change in View. Run the application and test login with Email or Username. did you hire someone to do it for you? Plz respond as I’m looking to create my own blog and would like to find out where u got this from. Thanks for this! Many internet sources for ASP/MVC just give solutions as custom classes. This is the first I’ve found that helps me alter the template.